LIMA, Peru (AP) — A 41-year-old Canadian who traveled to Peru to study hallucinogenic medicine was killed by a mob in a remote corner of the Amazon rain forest after people blamed him for the slaying of an elderly shaman, authorities said Sunday. 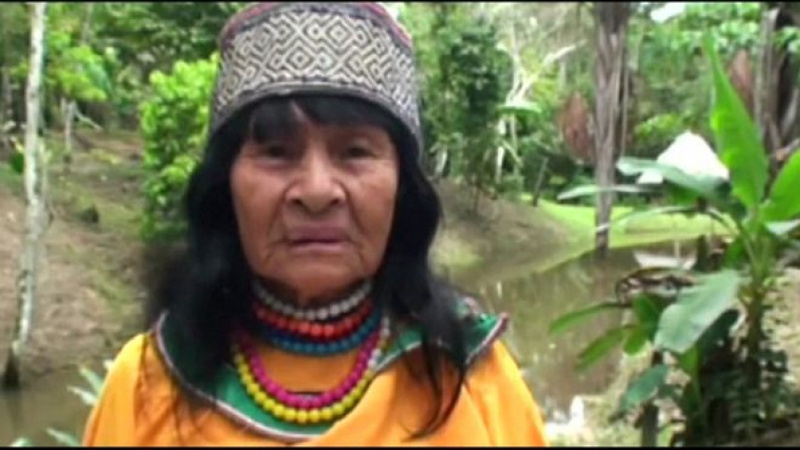 Peru's attorney general's office said Sebastian Woodroffe was dragged by the neck shortly after the killing of Olivia Arevalo, an octogenarian plant healer from the Shipibo-Konibo tribe of northeastern Peru. Officials backed away from initial reports that Woodroffe was the principal suspect in Arevalo's killing. On Saturday, officials dug up Woodroffe's body from an unmarked grave where he had been hastily buried. Every year thousands of foreign tourists travel to the Peruvian Amazon to experiment with ayahuasca, a bitter, dark-colored brew made of a mixture of native plants. The hallucinogenic cocktail, also known as yage, has been venerated for centuries by indigenous tribes in Brazil, Peru, Ecuador and Colombia as a cure for all sorts of ailments. But it's also increasingly consumed by Western tourists looking for mind-altering experiences, sometimes with deadly consequences. Arevalo was a staunch defender of indigenous people's rights in the region. She also practiced a traditional form of singing medicine that the Shipibo believe removes negative energies from individuals and a group alike. She can be heard singing a traditional plant song on the website of the Temple of the Way of Lights, which describes itself as a plant-shamanic healing center in the Peruvian Amazon. In 2015, a Canadian fatally stabbed a fellow tourist from England after the two drank ayahuasca together in a spiritual ceremony a few hours' drive from where Woodroffe was killed. Woodroffe, from the town of Courtenay on Victoria island in British Columbia, said before going to Peru that he hoped an apprenticeship with a plant healer from the Shipibo tribe would help his goal of changing careers to become an addiction counselor using hallucinogenic medicine. "The plant medicine I have the opportunity of learning is far deeper than ingesting a plant and being healed. It is not about getting 'high' either. It is true some of the plants I will be learning about do have a perception-altering effect, but these are a few plants out of thousands I will be working with," he wrote on the Indiegogo crowd-funding website seeking financial help to advance his studies. "I am in this for the long haul. This is more than a 'job' to me. I want not only for people to recover ... I want to turn them on to the wonders of existence, and have them leave as a renewed friend and lover of this thing we call life," he added.